This Rare Four-panel Print - This incredible design features one of the most popular ghost stories of all time, "Yotsuya Kaidan," a tale of betrayal, murder, and ghostly revenge. 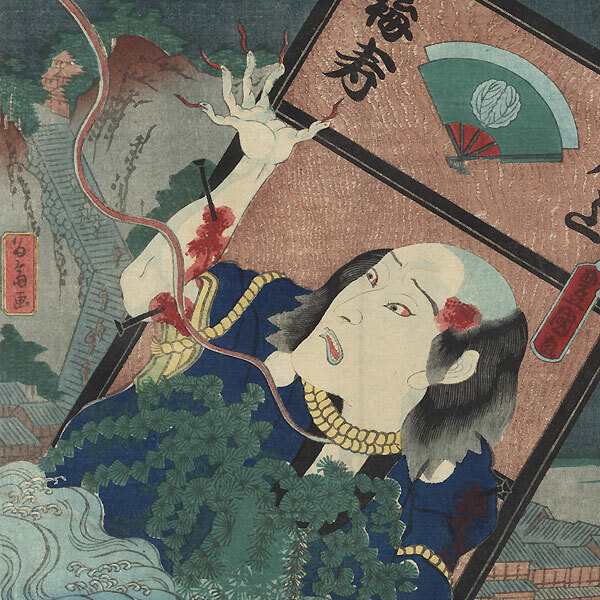 The ronin Tamiya Iemon attempts to kill his wife, Oiwa, by poisoning her, but the poison instead disfigures her. Seeing her horrible face in the mirror, she dies, but returns to haunt Iemon, who sees her hideous image everywhere and commits many murders trying to kill her ghost. An eerie spirit flame emerges from the body at right and runs continuously across the four panels, ending in what looks like a demon's head with an open mouth. 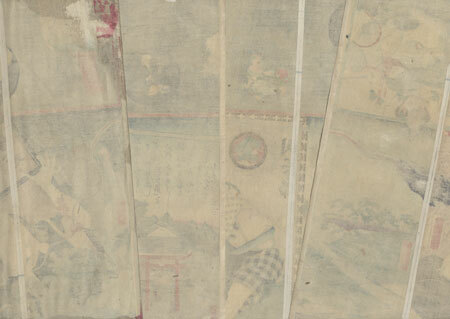 In the top of the left panel, Oiwa's hideous face appears over the edge of a folding screen, blood dripping from her mouth. In the second panel, Iemon emerges from the bushes with a knife in his mouth after tying a body to a door and disposing of it in the river. In the next panel, Oiwa's ghastly face appears in a paper lantern, her long black hair flowing around her with mysterious flames rising. The final panel shows the dead man tied to the door, which keeps resurfacing in the water, his mouth open in anguish and blood flowing from his many wounds. The expensive red orange pigment used on the head of the spirit flame has oxidized to a dark tone. A fantastic and rare, complete four-panel print illustrating this classic supernatural tale. Condition - This print with excellent color and detail as shown. Four separate panels. Backed with paper. Vertical centerfold in each panel. A few wormholes, small loss at edge, repaired. Slight toning and soiling, a few spots, slight rubbing at edges. Please see photos for details. Good overall.